Few things in life are as wonderful as taking tea with a friend and so it was I found myself once again waiting outside the wrong tube exit for Dom from Chocablog to go this time to a Chocolate Christmas Afternoon Tea at the Hilton. This tea is available for a *very* limited time only from Dec 13 to 26 so you’ll want to book in now for some time between noon and 6pm. We started by getting two of these lovely tea boxes brought to us. 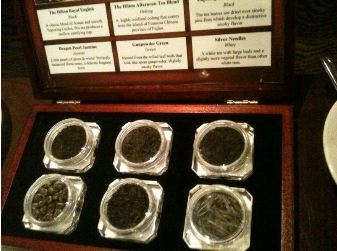 Each one had radically different teas in them and we could open and sniff each one to decide what we’d like. No more ordering based on a guess! This means you know what it’ll be like. Then when they bring the tea there is a timer showing when it will be ready. Dom got silver needles and I got the royal blend. The silver needles was like nothing I had ever tried and I wished I had gotten it myself but I got a traditional blend of black teas and we sampled each other’s tea. After tea, we were asked of we had any allergies. I mentioned my shellfish allergy so I was given a slight alternative sandwich selection as a result since everything was made fresh to order. You can see egg with cress, salmon, cucumber and ham though the prawn was missing because of my allergy. 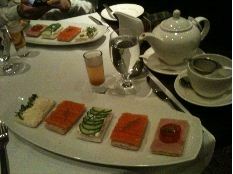 The bread was nice and everything was made for us so delicious and perfect with the tea. It was only slightly filling so we knew we would be able to eat the delicious yummies yet to come. While we were eating we had the chance to sip on hot apple pie shots which are part of the tea (available in non-alcoholic as well as our alcoholic versions). YUMMY! While we sipped our shots, we got our tower of deliciousness. This had a special selection of delicacies including freshly baked scones which were light and not too hard served with clotted cream and jam plus a praline spread. 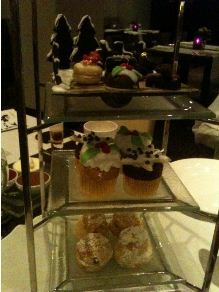 The next tier had a candied chestnut cupcake and a white chocolate with a mandarin filling cupcake. Both were delicious and I loved how the chestnut cupcake had a chocolate star on top. Delicious! Then we made it to the top. The top tier was all chocolate from the place to the trees to the fence to the Christmas pudding to the logs to, well, EVERYTHING! 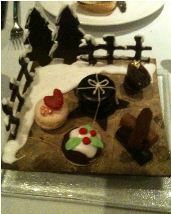 And really – the chocolate plate was actual chocolate! We even ate some to check 🙂 That is a while slab of chocolate that your chocolate is delivered on! All I can say is COME HUNGRY because this is great value for money. You will be stuffed after all this food and with an entire plate made of chocolate there’s just no chance you’ll leave anything but stuffed. If you’d like your tea with champers, it is £32.50 each and without champagne it is only £25 per person. Book soon though as it is for a limited time and you’ll want to get in before it ends!